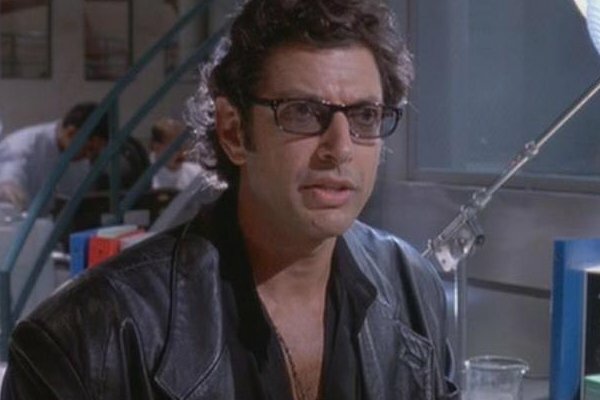 Now that we've gotten our first look at Jurassic World, the upcoming jump start to the Jurassic Park franchise, it's safe to assume that Colin Trevorrow is aiming to bring dinosaurs back to life in the imaginations of the movie going public. 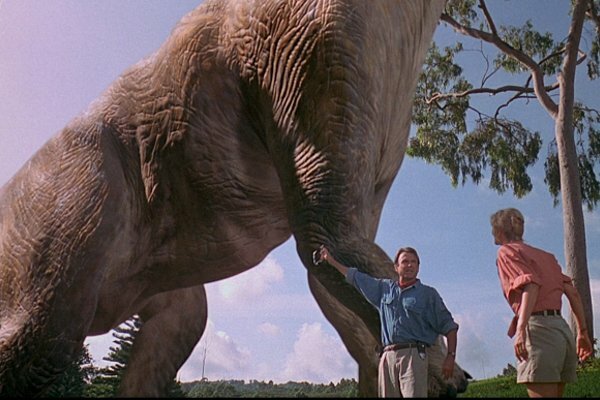 So what better time is there to recall the major milestones that Jurassic Park and its two sequels have given us over 21 years of the franchise's history? Obviously, Jurassic World is exempt from this list, since it's the new kid in town, but if that teaser is any indication, we'll have to update this list next June. But what are the greatest moments we’ve seen in the series so far? Read on to find out! Jurassic Park III started out with a lot of human drama, but started the real dinosaur action with a very surprising move. 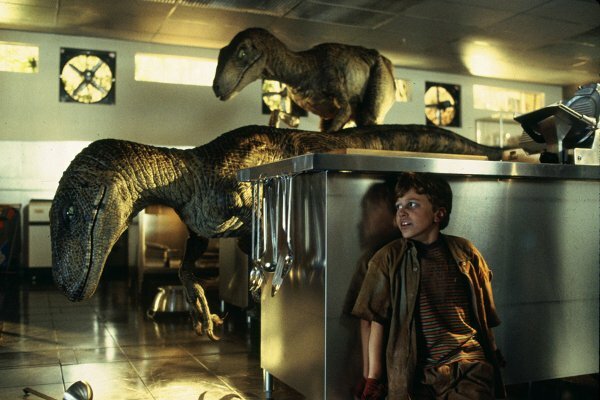 Whereas Jurassic Park had more drama and tension with its reveal, Jurassic Park III took the Clash Of The Titans playbook and ran with a good old fashioned dino fight! What's more, the beloved Tyrannosaurus was surprisingly offed by the new kid in town, the Spinosarus. And you thought the Rex was going to stick it out for the whole film, didn't you? 9. "Don't Go Into The Long Grass!" If Jurassic Park III is the goofy entry, and Jurassic Park is the film full of emotion and wonder tempered with thrills, The Lost World: Jurassic Park is the rough and tumble adventure film. 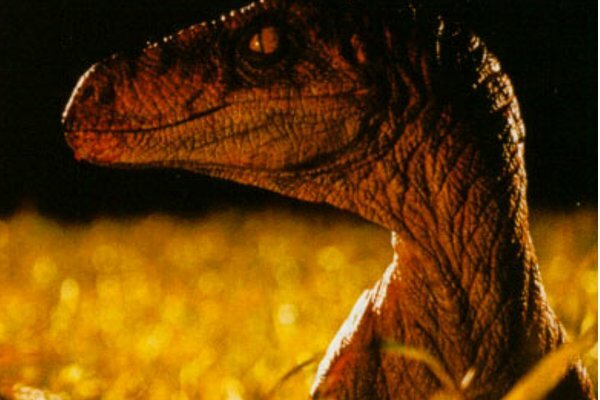 Based on that criteria, one of the best scenes from the film is when the entire party of hunters and scientist flock into a field of long grass, only to be stalked and eaten by a crafty pack of Velociraptors. While Jurassic Park talked about the predatory pack hunting the creatures engaged in, we truly saw it in action in The Lost World. 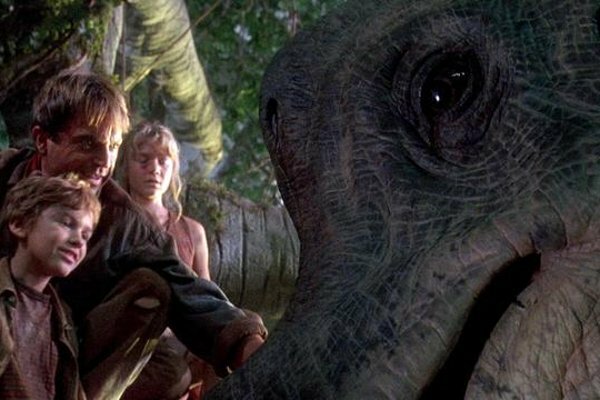 Jurassic Park had one Tyrannosaurus Rex, but The Lost World upped the ante to two and a half - that half being represented by an injured baby that Ian Malcolm and Sarah Harding try to heal. Of course, a being as primitive as a Tyrannosaurus doesn't understand this, and as such the concerned parents take care of the perceived threat through the only means at their disposal... brute force. 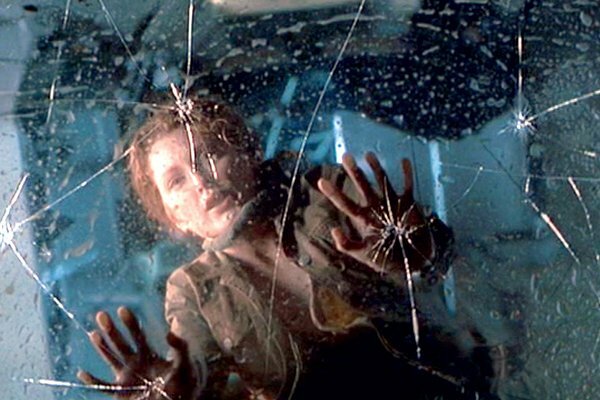 The cherry on top of the sequence is the taut rescue of Julianne Moore from falling through a rapidly cracking window, pictured above. 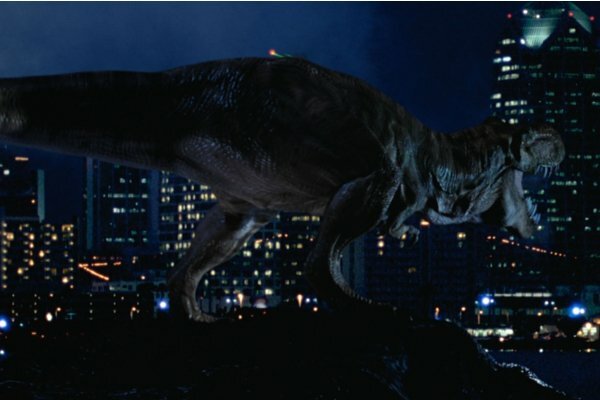 Fearing he'd never get the chance to ever do this again in his career, Steven Spielberg went full King Kong in The Lost World: Jurassic Park by bringing a prehistoric beast with no business being on the main land into the southern California city of San Diego. Much like Kong, this plan went wrong faster than you could say "run," and the Tyrannosaurus brought over from Isla Sorna did everything from trashing a public transit bus to eating the film's screenwriter. Seriously, writer David Koepp can be seen trying to get into the video store before his demise as the hands of the tyrant lizard. 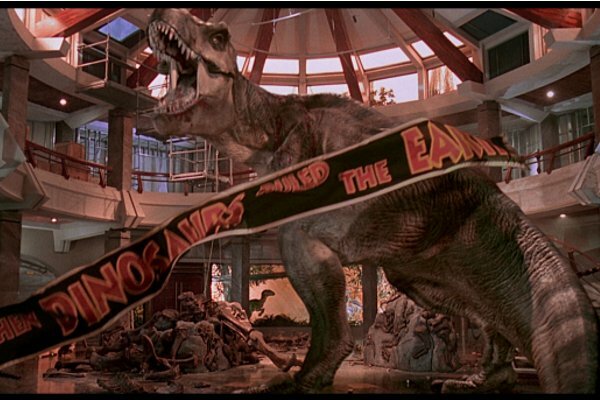 For a franchise that banks on disaster and carnage with prehistoric creatures, one of the most iconic moments from Jurassic Park’s first entry doesn't involve either element. In fact, this moment was from the tender, more introspective side of the plot, as it saw Dr. Grant and his two young companions, Tim and Lex, earn a temporary respite from all of the horrors to which they were witnesses. It doesn’t last for too long, though, as Lex winds up getting a full blast of Brachiosaur snot in a rather comedic moment. 5. "Life Finds A Way." A very character driven moment from a very memorable actor, Jeff Goldblum's warning that "life finds a way" to break the constraints humanity puts on it is both ominous and kind. This not only foretold the future revelation that the dinosaurs' genetic code allowed them to breed in the wild, it also became the moment people love to recall at movie themed cocktail party conversations. 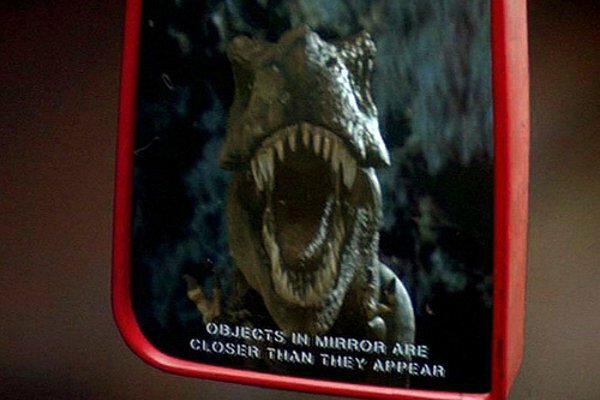 Jurassic Park broke a lot of ground when it came to special effects, with this moment being one of the most impressive. As Dr. Sattler and Ranger Muldoon search for Dr. Grant, Lex, and Tim; they manage to find Dr. Malcolm in the wreckage of the previous Rex attack. After rescuing him, they continue their search... at least, until the Rex comes back to the scene of the crime, and starts chasing after the Jeep containing our human friends. Thinking they're safe in the Visitor's Center, Lex and Tim start enjoying a huge meal that was supposed to greet the end of their initial voyage through the park. However, that sigh of relief leaves as quickly as it came, thanks to the pack of Raptors being smart enough to find their way into the center. Surprisingly enough, most of the kitchen chase sequence used more puppets than people would have thought in a film that pioneered CGI usage. 2. "Welcome To Jurassic Park." After a tense opening and a lot of exposition setting up the island we're eventually going to see, a beautiful two step reveal takes place. First, we see our first glimpse of Isla Nublar, the site of Jurassic Park (and now Jurassic World,) filling our eyes with lush beauty. Then, after some priming from John Williams' masterful score, we see our first dinosaurs of the picture. The turning point of the film, and film history, is when those Brachiosaurs first fill the screen in all of their splendor, showing us that Hammond is for real in his claims. 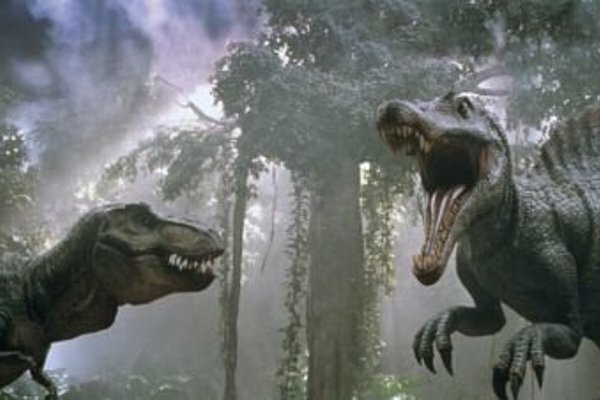 The moment to rule them all in the Jurassic Park franchise is none other than the glorious battle between the Tyrannosaurus and the pack of Raptors in the original Jurassic Park. It was both a show of the effects prowess that Steven Spielberg and ILM had at their disposal, and a throwback to the days of Ray Harrihausen's similar battles between beasts in stop motion. If Jurassic Park wasn't enough of a game changer by that point, the Rex's triumphant roar was the kicker the film needed to become truly legendary.